The restaurant’s new sign going up. Two men in Calgary are on the verge of opening a Halifax-themed restaurant. The restaurant is called Blowers & Grafton and is named after the Halifax intersection known as Pizza Corner. Robinson says the spot is iconic for Halifax food. “The food we find on Pizza Corner isn’t only available on Pizza Corner, but it does all congregate there,” he says. Samim Aminzadah, the other owner, is a Calgary native. He claims he was sold on the idea by Robinson’s cooking. 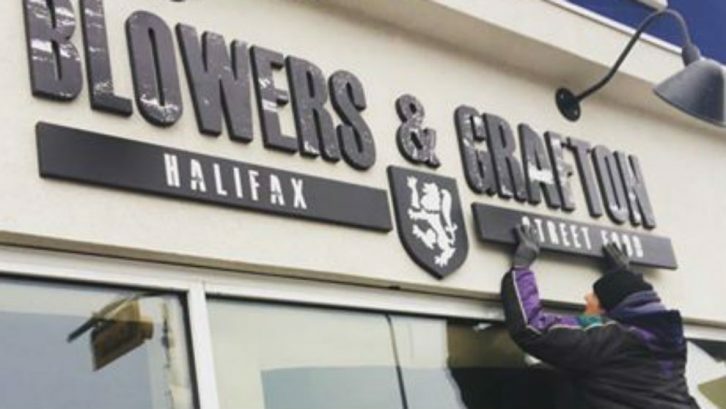 While not the first restaurant in Alberta to sell things like donairs, Blowers & Grafton is planning to capitalize fully on the Atlantic culture associated with the food. The two men met while working for an oil and gas company. Robinson finds the overall response has been quite positive, saying that many Atlantic Canadians living in Calgary miss the food, and are looking forward to the restaurant’s opening. “You meet Nova Scotians all the time out here and everybody misses certain things,” he says. Mentioning their recent appearance on Halifax ReTales, a website dedicated to tracking Halifax businesses, Robinson was particularly pleased with the social media response. “It’s the best thing we could ask for, as restaurant owners, that people are excited about it. As excited as we are,” he says. The restaurant has no opening date yet, but they have recently put up their sign. yes REAL egg rolls please! If you happen to have some Acadian dishes like Creamed Lobster sandwiches and “Rappie” pie, I’d be all over that too! I’m excited to see what you’ll have to offer. lol, yes real egg rolls… gawd that would be great… hey if you could get some Acadian food too, like rappie pie or creamed lobster sandwiches I’d be all over that too!